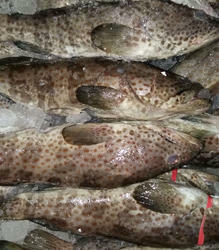 We have gained a remarkable position in the market that is involved in offering Brown Spotted Grouper Fish. In order to meet the specific requirements of our clients, we are engaged in presenting an excellent quality range of Tomato Banded Grouper to our clients. This Tomato Banded Grouper is a great source of protein and other nutrients that are good for health. We offer these products in good quality packaging at feasible rates. We hold expertise in offering a superior quality range of Blecker's Groupers. These fishes are found in north-west and south-west coasts of India. The fishes we offer are available from January to February. Moreover, the high grade packaging material is used by our professional in order to deliver fresh fishes to the customers. We offer high quality blecker s grouper reefcodd hamoor. Red Grouper available sizes. 300/500, 500/2kg, 2 kg up.